St Trillo’s Well has been on my personal must visits for some time. 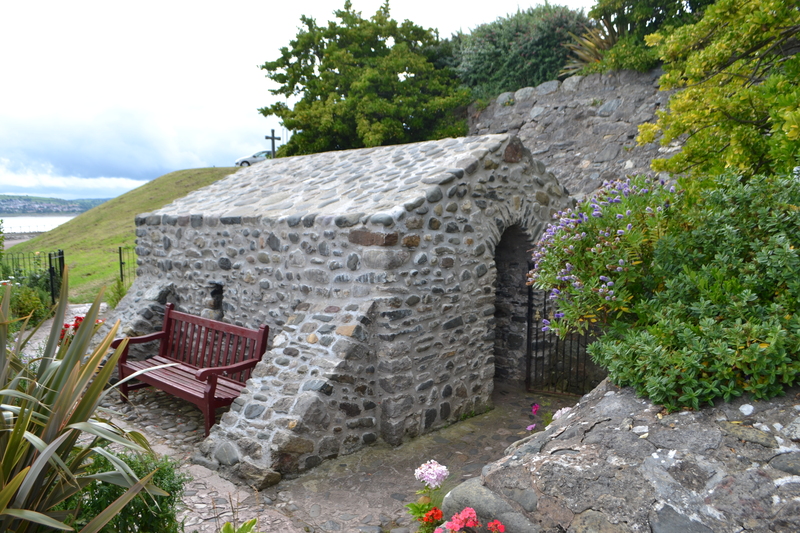 It is not only a unique site being a chapel enclosing a holy well – a rare survival – its location tucked under a seaside road, a juxtaposition between the seaside houses and the promenade and the sea makes it one of the most unusually situated. It is everyone’s classic view of an ancient chapel, privately arranged and simply adorned and whilst it may not be as old as first assumed it does have its own unique charm. I was particularly concerned that it may be open. Being a chapel I am always wary that like churches – urban areas and access do not often work. Yet parking above it, now almost hidden by shrubs and the hill itself, the path led to the railed enclosure which was open and walking around I pushed the old wooden door, it yielded and I was in. As soon as one enters, one is overcome with a feeling of peace. Whatever frivolities gone on outside feel an eon away. 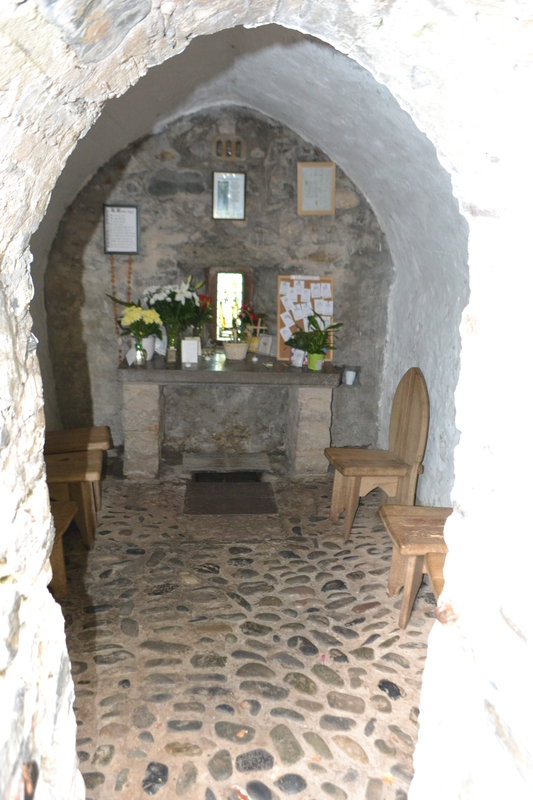 As a chapel it is very unusual, being claimed with its room for six chairs, to be the smallest church in Britain. This is no folly but a functional place of worship for the congregation which meet for communion on Friday mornings and those more intermittent visitors who leave votives and prayers. For perhaps uniquely again for a British well, the saint’s intercessions are still asked for via its well. It has remained well looked after ever since, being adopted by the church of Wales who have a rather intimate Eucharist ever Friday at 8 am during the summer. The first thing to notice is that the well is central to the chapel’s function being positioned in the centre beneath the altar. It is covered by a metal grill and two wooden slats. Upon removal two steps appear, suggesting perhaps that the water was easier lower or else individuals entered it for baptism. Indeed, baptism appears to be the only recorded function for its waters. 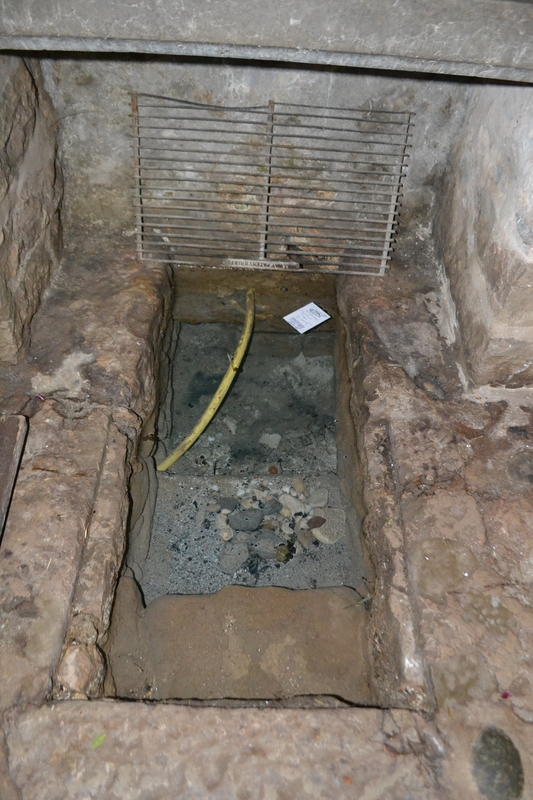 The water is clear and arises at the foot of the hill being channelled into the well chamber by pipes. It is clear that it was the spring which caused the saint to establish a hermitage here. But stated nothing more. Interesting there are no ‘modern’ traditions of the well and it would appear it has become a largely supplementary feature to the chapel’s powers via the intercession of St. Trillo. St Trillo who is shown with fellow local saint St Elian, in two small stained glass windows in the chapel, was the brother of two other saints, Tegai and Llechid and was a monk of Bardsey Island before settling here. He is also saint to have been involved with the Diocese of Bangor Diocese. However, like many 7th century saints little is really known. 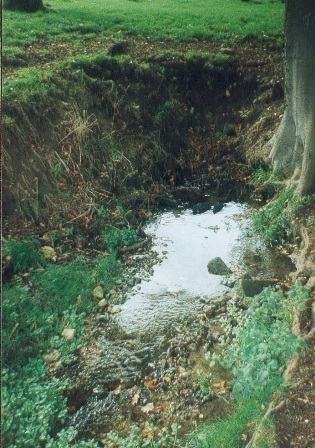 Located as it does seems an unusual place for a holy well perhaps but as Francis Thompson (2008) in his Early Hermit sites and Well Chapels states its location is not that unusual. Indeed, along with cliff races, islands and valleys, it was another ideal location for a hermit to reside. Furthermore, it was a very fortunate place to be, the sea would provide a harvest and even today the rock pools are full of winkles, mussels and edible seaweed. The survival of a medieval fish trap a few yards from the chapel is also significant and may have been the occupants attempt to provide a more substantial harvest by trapping fish. Not only would such a location provide a bumper food supply, fishermen may have provided money in thanksgiving or offerings for a profitable and safe fishing. “The present custom apparently began in the summer of 1992. Arriving as usual one Friday morning to celebrate the Eucharist, the vicar of Llandrillo, Canon E. Glyn Price, found a single piece of paper impaled on a nail sticking out from the wall of the chapel, containing a hand-written prayer. Touched by its contents, he left it there; and the following Friday found that it had been joined by several others. The vicar placed them all on the altar. Since then, the practice has continued uninterruptedly, without any encouragement (or-perhaps significantly discouragement) on the part of the parish clergy. In Hulse’s article he notes that the principal petition was regarding health (19). Interestingly to those prayers which are addressed, these according to Hulse’s survey was overwhelmingly to God (17) compared to the saint (8), although a number were ambiguous in their dedications. The ailments ranged from Insomnia to Cancer, through eye problems, stress, a physical disability or else concerned the well-being of the family whether through reconciliation of its members, improvement of the quality of life or overcoming bereavement, the commonest perhaps reflecting more the age of the votive despositer. One even requested help to learn Welsh! The majority were women. These votives still cover the altar as can be seen and between the two visits I made they had clearly changed. 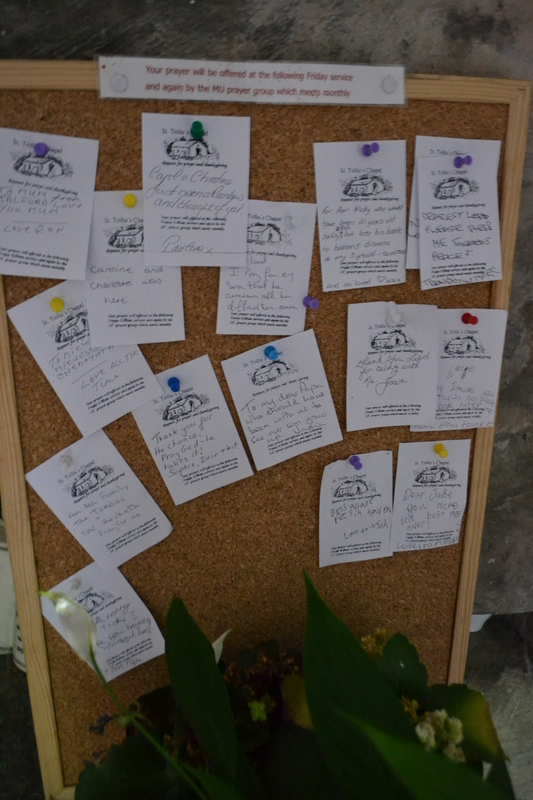 Now official notelets are produced and pinned to the board beside the altar, these two changed between the visits. Indeed, sitting for just over an hour a steady stream of ‘pilgrims’ can be seen many just curious, others did appear to leave something..so it pleasing to see this most romantic of well chapels still functioning in 21st century Britain. 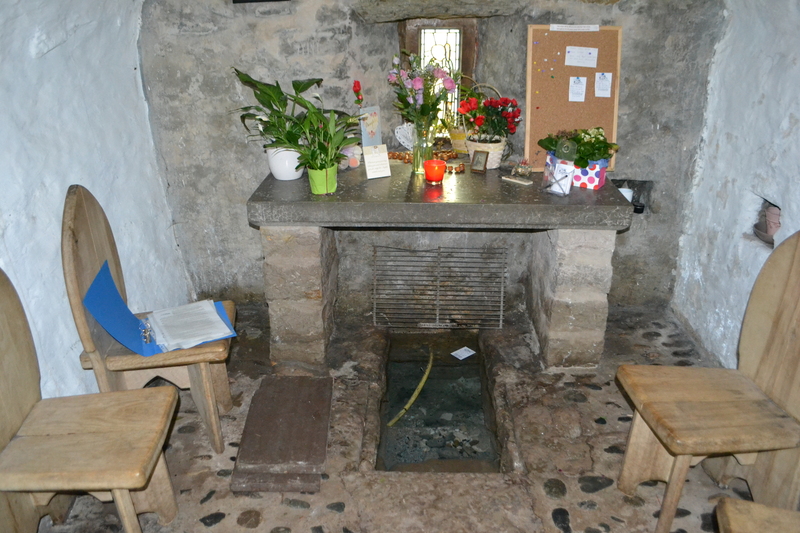 If you visit only one holy well after reading this blog – make it this one. Easy found and reached (and signed) either by walking along the promenade or driving Marine Parade to Trillo Avenue, Why? For its peace, for its uniqueness, for its feel of the ancient, a connection to the time of hermit saints – or for the fact you can visit this, have an ice cream, do rock pooling and see the oldest puppet show in Britain…what’s not to like!? This profane and heathen devotion appears to be more about the bird’s nest and its bird who’s tameness was put down to the holiness of the place. A peculiar cult had thus developed. However, it was possible that the Bishop was wrong in viewing the bird as part of the cult. The leaving of money deposits in the nest was probably because it was a convenient and safe place rather than being ‘for the bird’. The Bishop had informed them that the coldness of the water was responsible for the cure and the rural dean was ordered to fill in the well and tear up the tree. Excommunication was threatened against anyone who visited the site. This was apparently done, but it is clear at some point the well was uncovered. Presumably the bird flew away.